Happy Veteran's Day! I had to work today, but I know a lot of you had the day off. I told you a week or 2 ago that I had more of the KBShimmer Fall collection polishes to show, and I will be starting them tonight. As I said before, these are the first KBShimmer polishes I've purchased and I am immensely impressed thus far. Carpe Denim is a deep denim blue jelly with silver holographic glitter. Since this is a jelly polish I expected 3 coats for full opacity. The first coat was a little sheer, but 2 was just fine for me (if you have really long nails you may need 3). Overall, the consistency and application were no issue at all. Is it just me, or does Dark & Twisty remind you of Twisty the Clown from American Horror Story Freak Show? I think it is the mix of carnival colors. AHS Freak Show was not my favorite season by far, but I'm pretty happy with Hotel so far. Let me know your thoughts in the comments! Ok, back to polish! 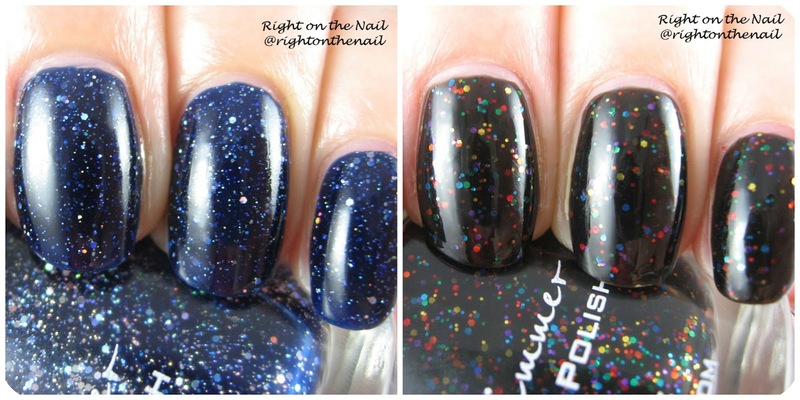 Dark & Twisty is a black jelly polish with muli-colored hexagonal glitter. I don't know how she does it, but you really get to see the glitter well with the base that fully covers the nail line. Isn't amazing how OPI hasn't learned how to do this? The pictures show 2 easy coats with topcoat (again, if you have long nails, you may need 3 coats). You can buy most KBShimmer polishes for $8.75 and their Winter 2015 collection was just released at the beginning of November. Make sure to check them out on their website, Facebook, Twitter, and Instagram for more information.